Craft brewers today are an innovative bunch. Some brewers are crafting beers with strange fruit, grain and herbal ingredients, beers aged for years rivaling distillers of whiskey or scotch, and using wild strains of yeast where the brewer has no idea up front which flavors she or he will get. But one of the craziest recent trends is the advent of “extreme beers”, or beers brewed to have unconventionally high level of alcohol. We stumbled upon one of these extreme beers last year in London. After finishing a street art tour in the East London neighborhood of Shoreditch, our beer loving guide recommended we stop into the nearby pub owned by a Scottish brewer called BrewDog. 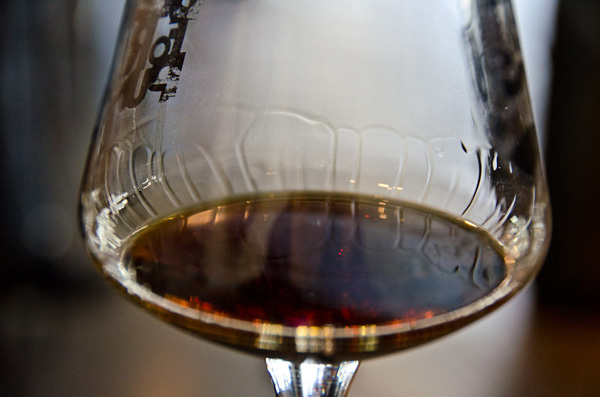 As I scanned the tap list, one beer stood out — first for its goofy name (“Tactical Nuclear Penguin”) and second for the shocking number scrawled next to it: “32% ABV” (Alcohol by Volume). I was surprised, but I ordered a glass. I’d never before seen a beer with that high percentage of alcohol. For comparison purposes, Budweiser, Corona, and Heineken range from 4-5%. The highest you can typically find on a specialty beer market’s shelves are double and triple fermented ales and barleywines in the 14-16% range. BrewDog prides themselves on pushing the boundaries of brewing, and they threw themselves into this unique challenge of making the strongest beer in the world. With the help of the sub-zero industrial freezers at a local ice cream factory, they froze the beer and then removed the pure water ice to make a thick, concentrated liquid more akin to hard liqueur than a beer. Check out this crazy video about their production process. 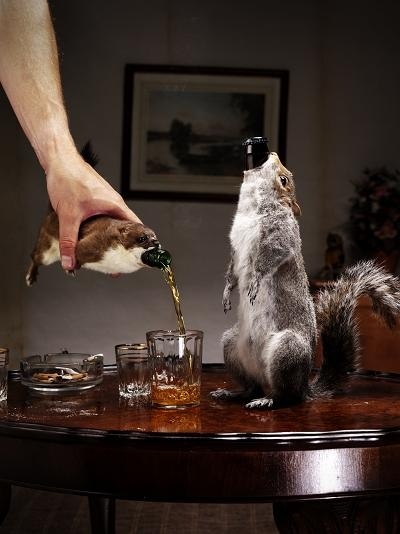 BrewDog only produced 11 squirrel-blanketed bottles of “The End of History” which are now sold out, so Tactical Nuclear Penguin is the strongest one BrewDog typically has in stock. Also, at a cost of 6 British Pounds for a tiny (25 mL/0.8 oz.) pour of TNP, we couldn’t afford anything stronger or more limited quantity! With that said, how did it taste? 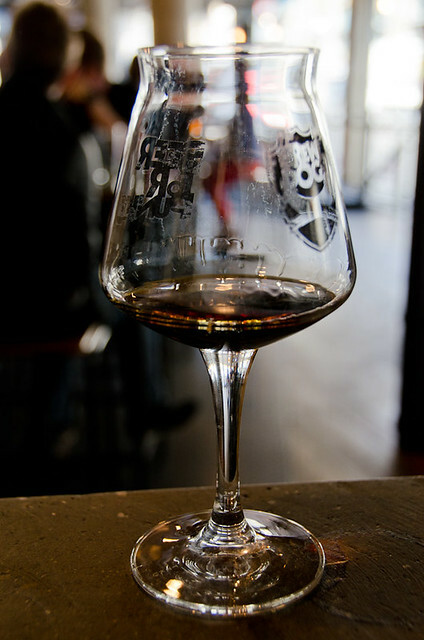 Tactical Nuclear Penguin was served in a snifter glass, just a small tasting-size pour meant to be savored like a fine whiskey or Scotch. It was hard to taste or smell anything beyond the strong alcohol, though the syrupy texture and bitter sweetness reminded me of molasses. While extreme beers are bit of a novelty and not really something I’d want to drink a lot of, I’m interested in seeing brewers do creative things and push the boundaries of how we define beer, wine, and spirits. I applaud BrewDog for that. Update 8/2016: I was excited to learn that BrewDog is coming to U.S.! They are building a cooperative brewery in Columbus, Ohio which will increase supply of their fine beers across the pond. They are currently inviting U.S. beer lovers to invest in the project and become a member. Find out more about their Equity For Punks project here. Have you ever tried an extreme beer? If you ask me, that squirrel thing is a little effed up. You’re a little effed up!! Wow. Sounds like a fun novelty, but I’d rather have a beer that you can actually drink. Wow some of these beers look intimidating. The names themselves would make think twice before I order them. I favor familiar flavors as I’ve been disappointed with novelty brews.